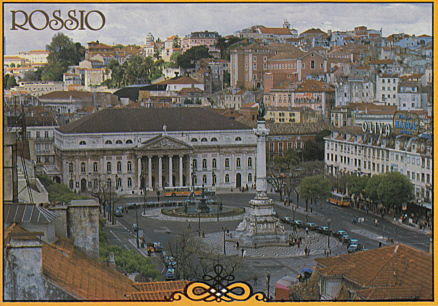 Built 1843-1846 as "Teatro D. Maria II" by Fortunato Lodi after an initiative by Don Fernando II., King of Portugal. Named in honour of Fernando's wife, Dona Maria II. (1819-1853), Queen of Portugal. 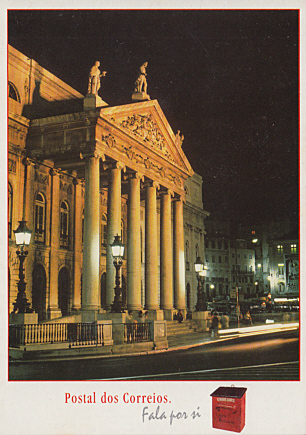 Opened 13 Apr 1846 (on Maria's 27th birthday). 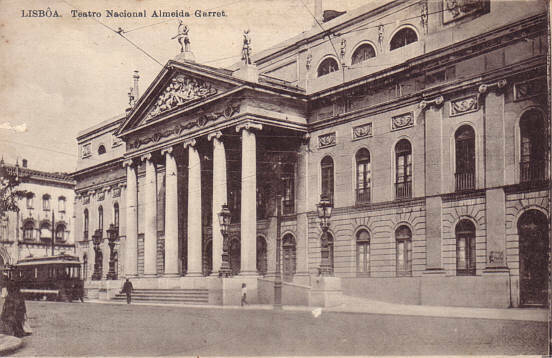 1910 renamed "Teatro Nacional Almeida Garrett" in honour of the Portuguese playwright and statesman, João Baptista da Silva Leitão de Almeida, Visconde de Almeida Garrett (1799-1854). 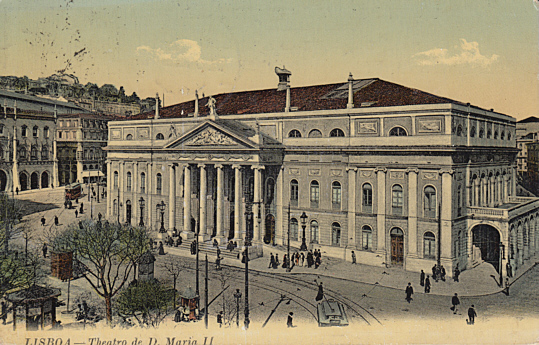 Later re-renamed "Teatro Nacional D. Maria II". 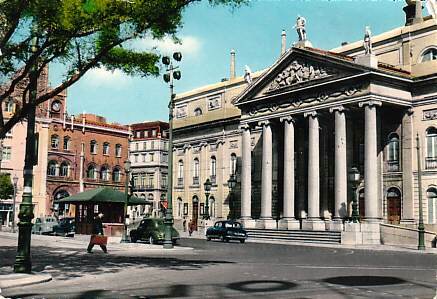 Destroyed by a fire on 2 Dec 1964, with only the exterior walls remaining. Subsequently restored to the original designs. Re-opened 1978. 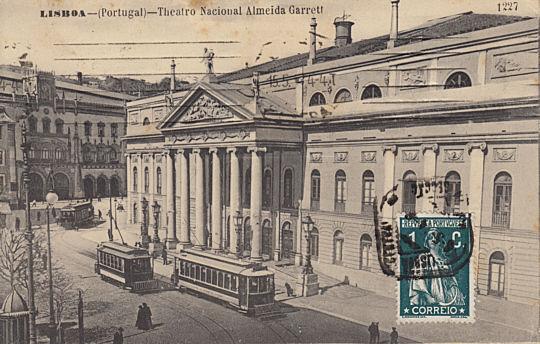 The theatre includes the main stage, "Sala Garrett" (699 seats), and a studio theatre, "Sala Estúdio Amélia Rey Colaço/Robles Monteiro" (80 seats). Used for drama performances. 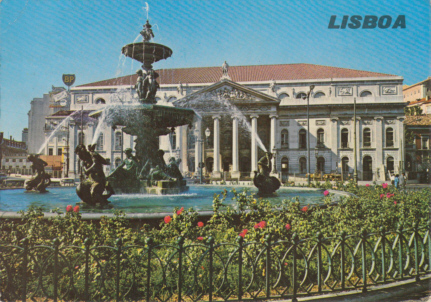 Front Text: "Lisboa - Theatro de D. Maria II"
Front Text: "Lisbôa - Teatro Nacional Almeida Garret"
Front Text: "Lisboa (Portgual) - Theatro Nacional Almeida Garrett"
Reverse Text: "Lisboa - Rocio, Teatro Nacional - Rocio, Théâtre National - Rocio, National Theatre"
Reverse Text: "Lisboa - Teatro Nacional; Lisboa - Théâtre National; Lisboa - National Theatre"
Reverse Text: "Lisboa - Portugal - Teatro D. Maria, Théâtre D. Marie"
Reverse Text: "Lisboa - Portugal - Rossio"
Front Text: "Postal dos Correios. 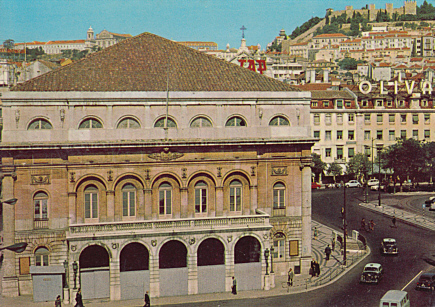 Fala por si"
Reverse Text: "Almeida d'Eça, Teatro D. Maria II, Lisboa"